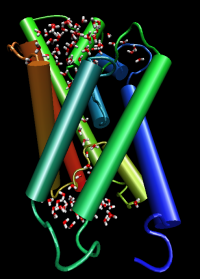 Aquaporins, channels responsible for the conduction of water across cellular membranes, have been the subject of much recent work in the Theoretical Biophysics Group. Read more about our work on Aquaporins. The E. coli Glycerol Facilitator (GlpF, shown at right) is an aquaporin with an extra feature; it also allows small, linear sugars such as glycerol and ribitol to pass. The three-dimensional structure of this aquaporin was recently discovered by researchers at the University of California, San Francisco, and the function of this channel is described in a TCB publication. Amazingly, while GlpF allows sugars as large as ribitol to pass with ease, it is impermeable to all ions, including protons. At the left you can see a sodium ion in comparison to a molecule of ribitol. Despite the ion's smaller size, it is unable to pass through the channel. Part of the explanation for the precise selectivity of GlpF might be found in the differences and similarities between ribitol and a very similar sugar, arabitol (shown at right). Arabitol, though it differs from ribitol only by a slight rearrangement of atoms, is conducted through the channel ten times less quickly. Interactive Molecular Dynamics (IMD) allows us to examine the interactions of ribitol and arabitol with the channel in detail. We ran a simulation of the channel in NAMD, and used VMD with a haptic device to pull each sugar through the channel by hand. Our experience from the earlier simulations of glycerol served as a guide as we pulled each molecule of sugar through; we continuously adjusted the molecules to fit the walls of the channel as well as possible. 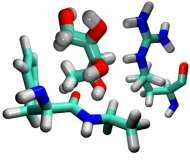 On the left you see an animation of a molecule of ribitol being passed through the channel. The IMD simulations have allowed us to reveal this pathway and the pathway that arabitol follows through GlpF. Further analysis of these paths is providing us with information about the function of each section of the channel, demonstrating in detail the source of its amazing selectivity. Here is a picture of the interesting C-shaped conformation that ribitol takes as it passes through the narrowest part of the channel. We believe that this part of the channel is where passing molecules are sorted by shape; only the molecules that can fit through the filter will make it to the other side. See the IMD page to learn more about Interactive Molecular Dynamics, or read more about our work on Aquaporins. Contact Us // Material on this page is copyrighted; contact Webmaster for more information. // Document last modified on 04 Aug 2006 // 23660 accesses since 20 Mar 2006 .